A home gym with proper equipment can be beneficial as it gives the opportunity to workout whenever one wants. Home gym equipments might seem expensive but it's a one-time investment and will save a lot of money on monthly gym fees. Elliptical machines - Low impact exercise machines that can provide enough workout for the whole body. Exercise balls - Unique exercise gears; they can be incorporated in almost any workout regimen. It can make your workout fun and help you achieve your fitness goal. Mini trampoline - If you want to have fun while exercising, then you should definitely consider purchasing a mini trampoline and get an excellent aerobic workout. Exercise bike - Provides a great cardio workout in the privacy of the home. You can also purchase exercise bikes that will give the option of applying resistance and increasing the intensity of an exercise. Push up bars and pull up bars - Are very essential for staying in good physical condition as they provide work out for the arms, chest and back. If budget is limited, opt for resistance bands, dumbbells and an exercise ball. When purchasing equipments, one's likes and dislikes are to be kept in mind. For instance, if you like to run or jog you should definitely consider purchasing a treadmill. It is essential to purchase good equipment as purchasing cheap bad quality equipment can lead to injuries and affect the health. 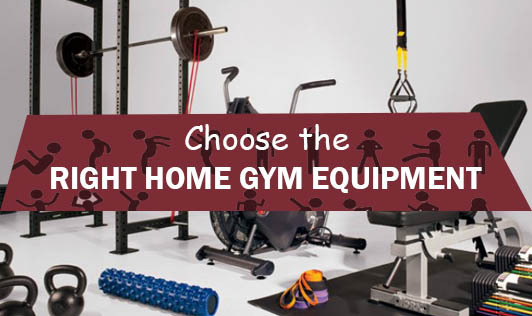 Home gym equipment should have variety that would allow a person to workout different parts of the body. Before purchasing, have a basic position plan for your equipment.